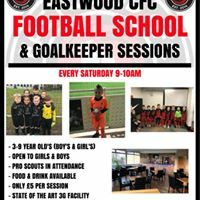 Every Saturday Eastwood CFC deliver an hour of football fun and learning through our FA Qualified coaches. Children aged 4-9 years of all abilities are welcome. For your first session turn up slightly earlier for a quick registration form and sessions are just £5!